Today's Simulacra can be found hiding in the garden. 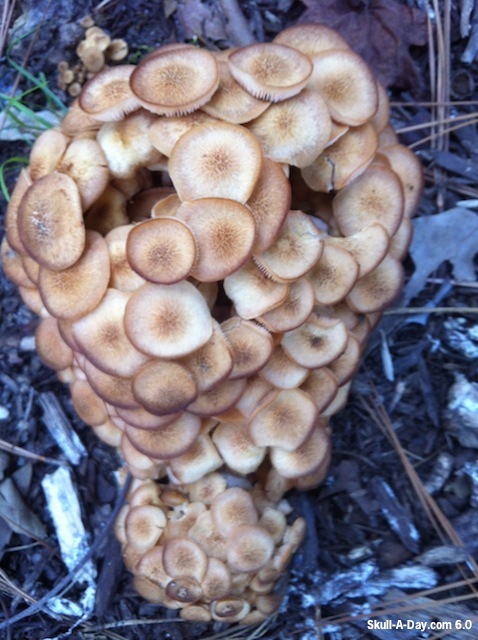 First up is Carlton K at Spiderbite Studios in Richmond, VA who found this cluster of mushrooms growing in his backyard. 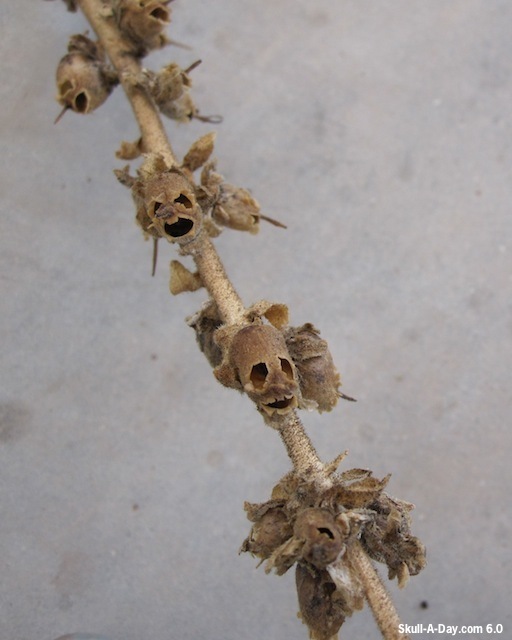 Our next foundling is from Linda K. Williams in Tucson, AZ who discovered this old stem of snapdragons flowers that produced these cool skull seed pods. As the days begin to noticeably shorten, and the liveliness of our surroundings start their dormancy it is wonderful to see how our surroundings are symbolizing what we know is happening under the surface. 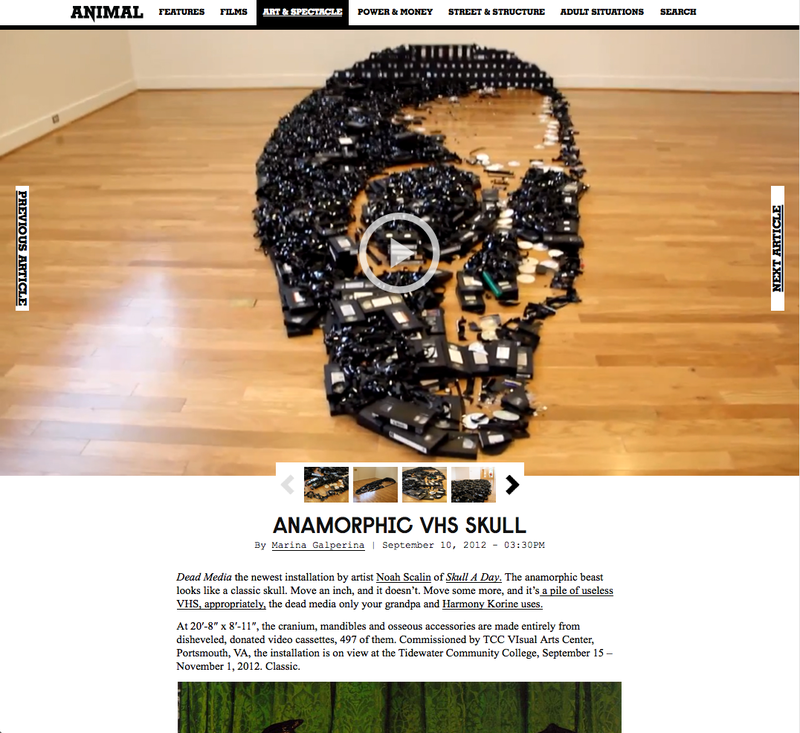 Thank you both for sharing your simulacra finds with us. 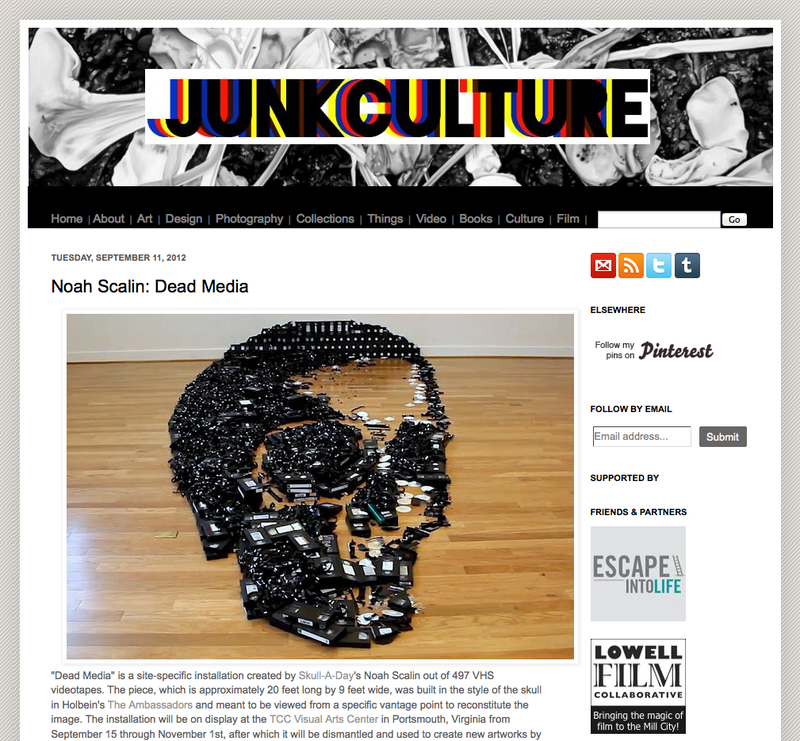 Knoxville, TN is the home of Cootie who is an avid skull artist who dabbles in many mediums, but one of her favorites is to make plaster skull molds and then give them life by adding unique (non)face paint to each one. 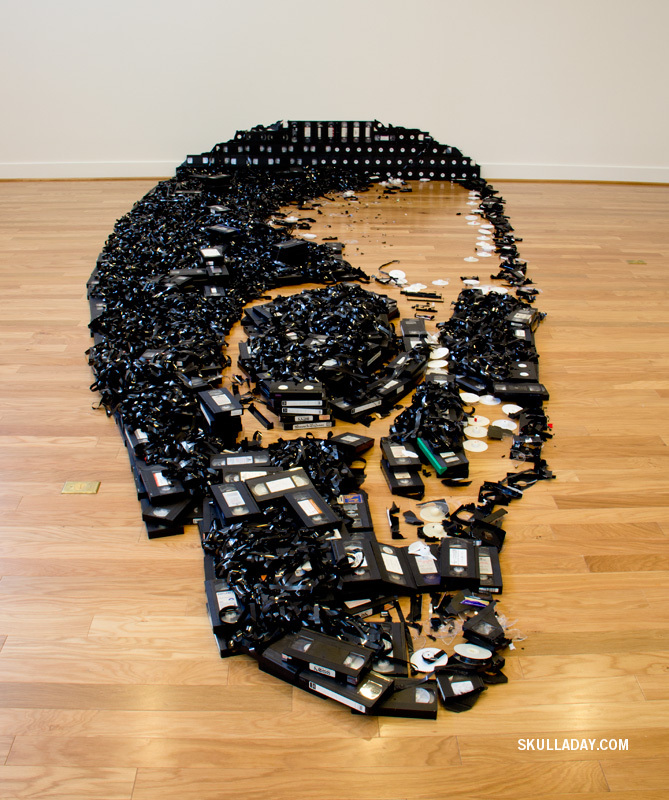 Even though the molds are the same each skull takes on it's own personality at the whim of the artist. The differences are noticeable to our eyes based on what we see, but just like us, they are all the same underneath. 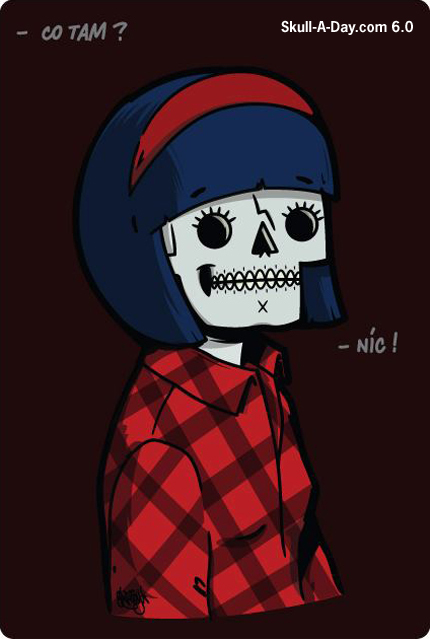 If you want to see more, or even own, some of Cootie's skulls then check her out here. Thanks, Cootie! Mark Taylor from the UK is back again with another painting. 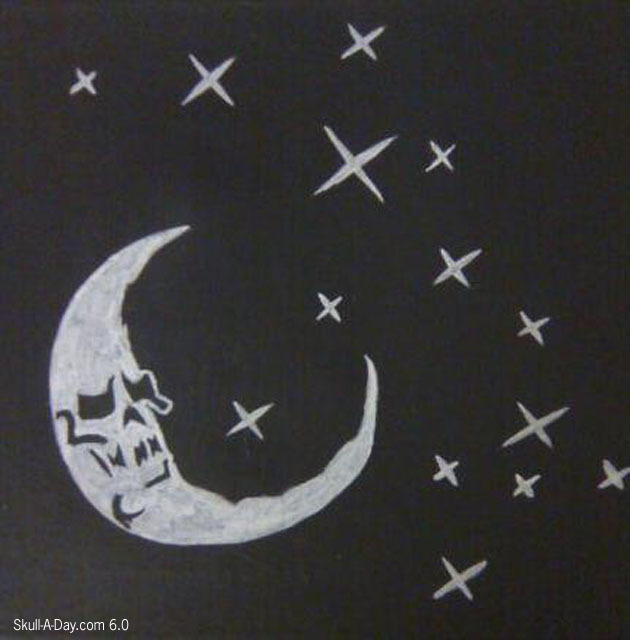 This one is titled "Skull Moon". It's painted with white acrylic on black canvas. When I look at the full moon, I always see a face. What about a partial moon? Is that a partial face? 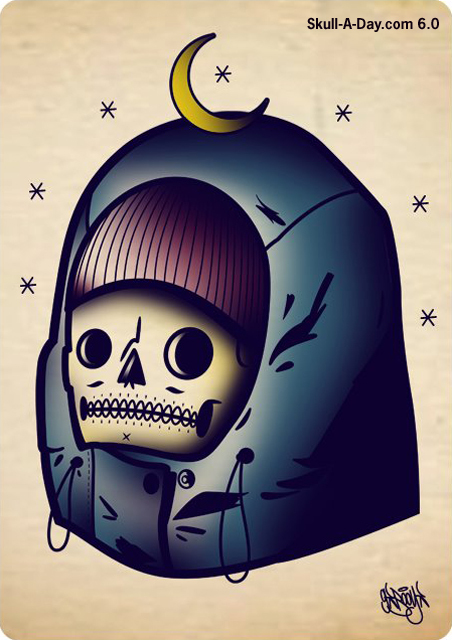 In Mark Taylor's mind, it's a skull moon. Next time I gaze at the bright moon, I'll see if the craters make a skull and not just a friendly face. Past contributor Victoria Goulden wrote: "Here are some pieces I made recently for the upcoming Dia De Los Muertos and a Frida Kahlo piece. Both are made largely with recycling methods... Rag Rugging and Papier Mache"
It is always wonderful to see the up-cycling of materials to create new pieces of art. You have channeled Frida with this wonderful traditional folk inspired work. Thank you for continuing to be a supporter of our site with your recent submission. 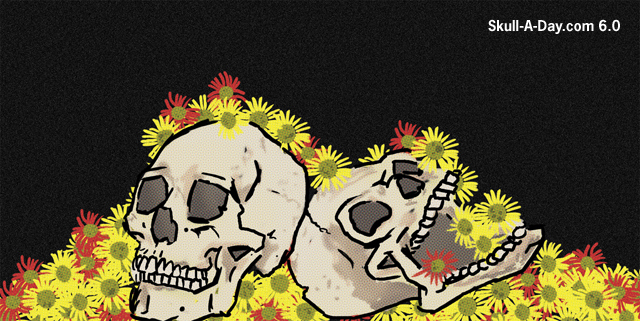 Things are looking up here at Skull-A-Day. 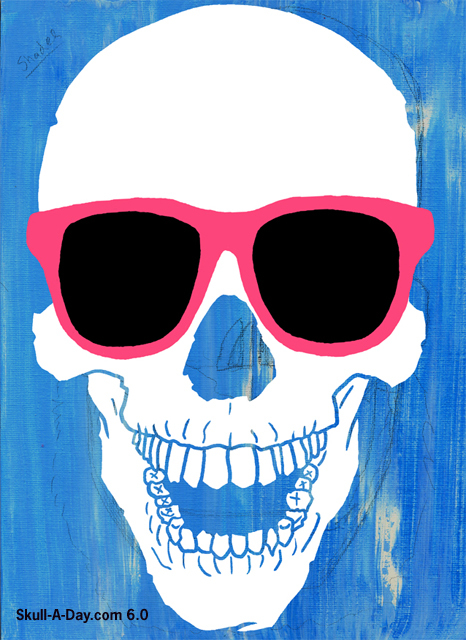 In fact our future's so bright, our skulls gotta wear shades. 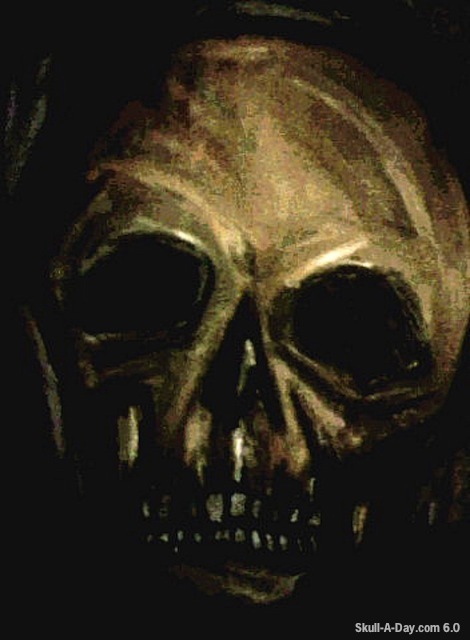 Well, at least today's skull from Pat Henzy is feeling the positive vibe. Both of these submissions are mixed media of pens, pencils, and photoshop. Congrats are also in order for Pat who recently completed a 365 challenge with a drawing a day featured here. There are lots of other skulls and crazy stuff to check out. These two pieces are great examples of how multiple media styles can combine for harmonious skull unity. Thanks for sharing, Pat! 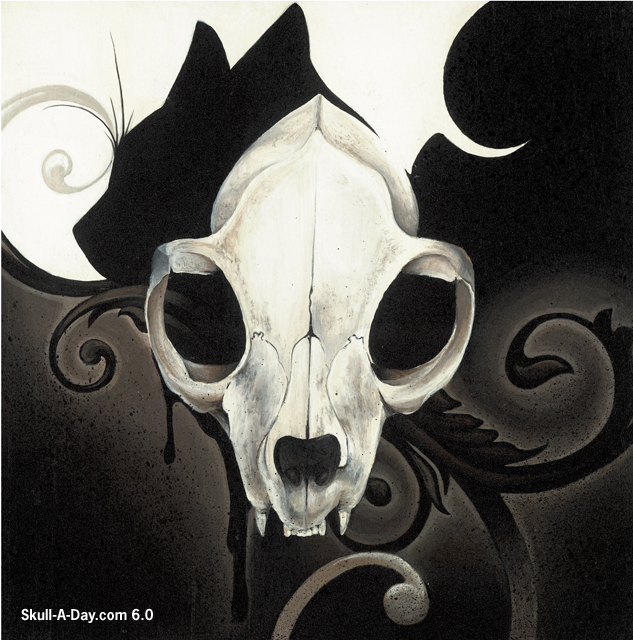 Shona Penny loves creating skulls in her art. 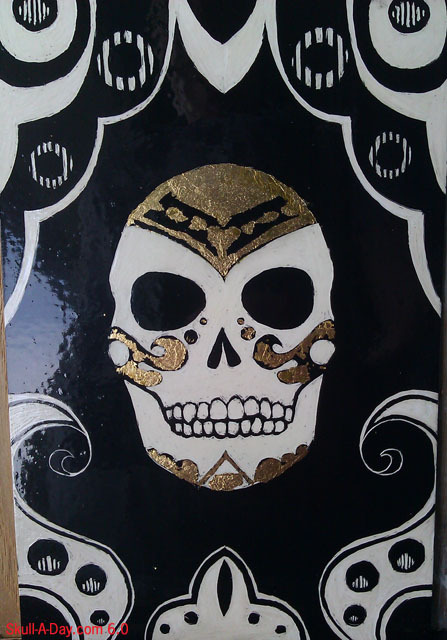 She made this "Golden Skull" with a scratchboard and faux gold leaf. I love the sharp contrast that using basis scratchboard lends itself to. 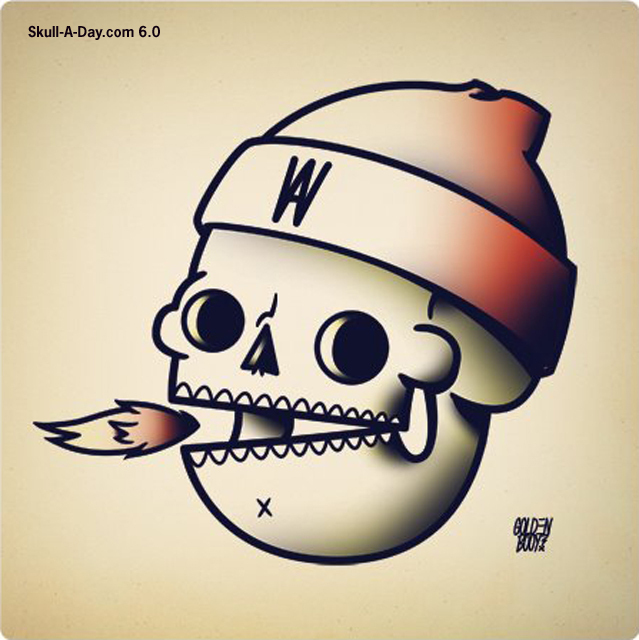 Shona used this contrast well to define the details of the skull, and boarder design. The use of faux gold foil adds a metallic shimmer to the piece, and highlights the facial design. The addition of a sealer helps the overall piece to shimmer. Congratulations to Christoper in Guelph, ON Canada and Bridgett in Bellingham, WA who were the randomly chosen winners of a prize pack from from SKULLebrities®! Thanks to everyone who participated, we loved reading all of your creative suggestions! If you haven't already, be sure to read them all HERE. 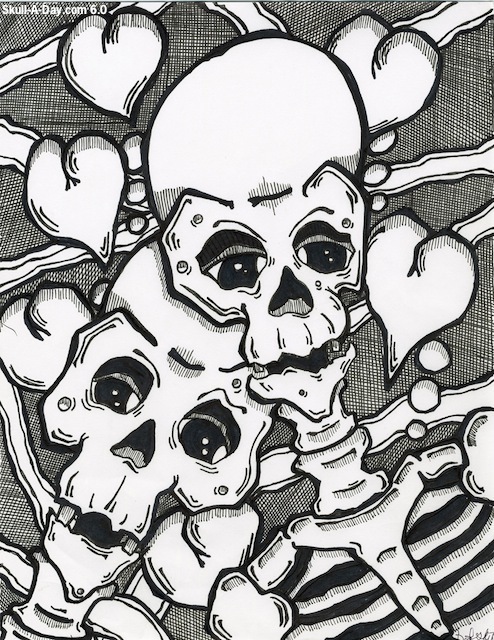 And don't forget, even if you didn't win, the folks at SKULLebrities® are continuing their 25% discount for our fans through the end of the week (September 30, 2012). Visit their shop to purchase one or more of their SKULLebrities® designs, then enter SKULLADAY at checkout to get the discount. Stay tuned for more giveaways soon as we have a very exciting October planned for you! 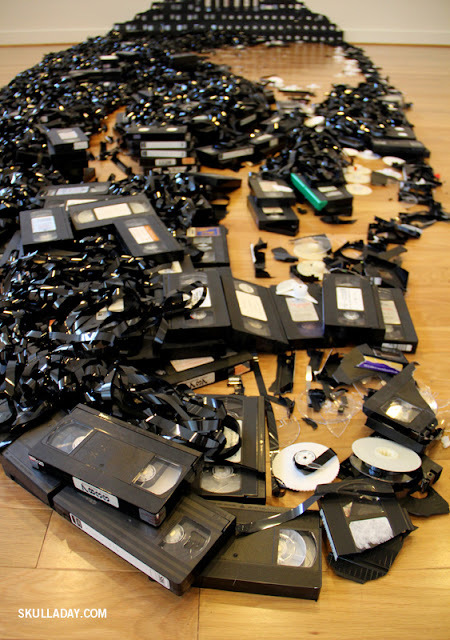 Today’s simulacra are so good you just want to eat them up. First up is Ken Bricker from Eugene, OR who could not decide on what to call his find he suggested “Waterskelon” or “Skelemelon” for it. 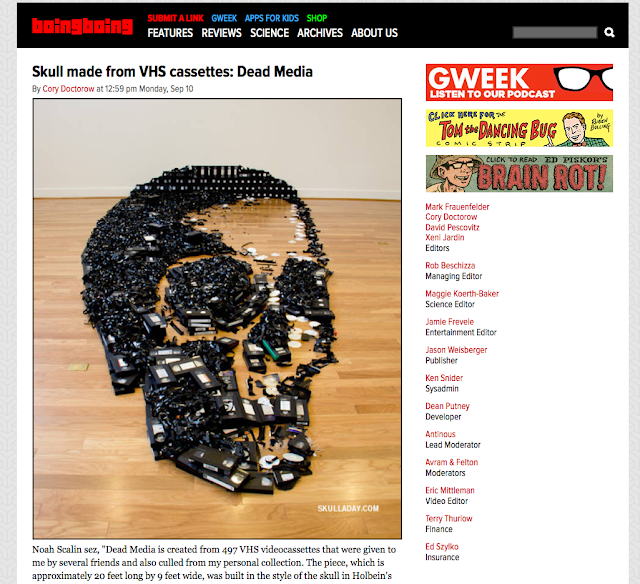 ♪♪♪ Skulls glorious skulls! Ice Cream and Watermelon! ♪♪♪ Thank you both for providing us with this wonderful bounty to satisfy our skully appetite. 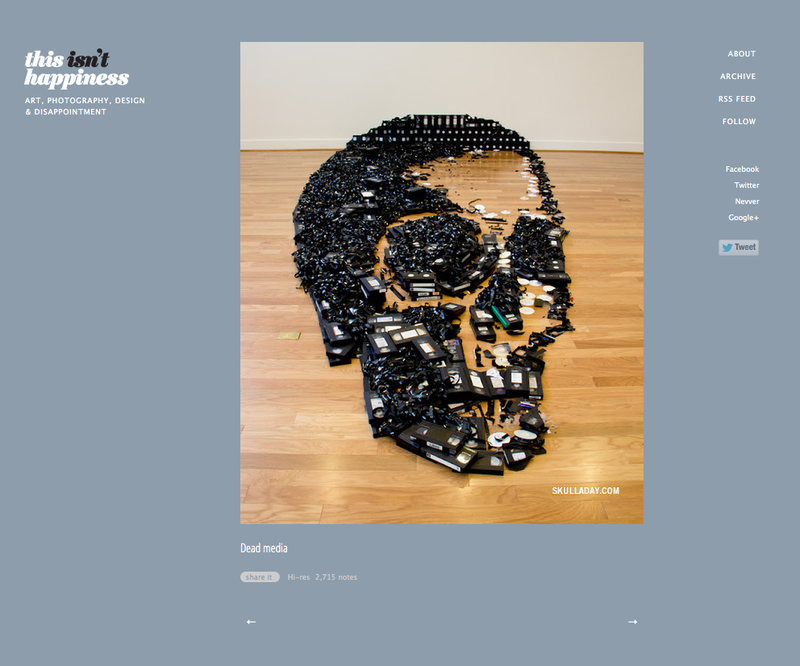 You gotta love the creativity of this awesome skull courtesy of Doug Eichenberg of Cuyahoga Falls, Ohio. 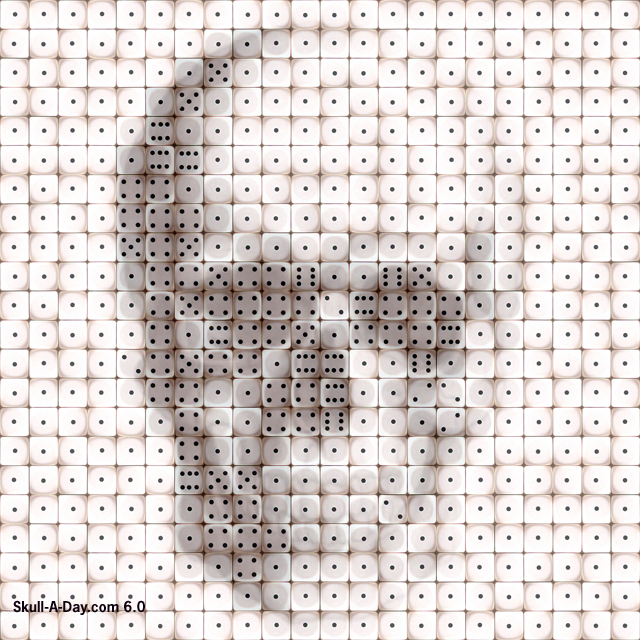 He created this image with scans of each side of a six sided white die. Take a chance to roll them bones and see what lady luck presents to you. We got lucky enough to roll a set "skull eyes". Doug also has a website that you all might like that's also Obsessed With Skulls. 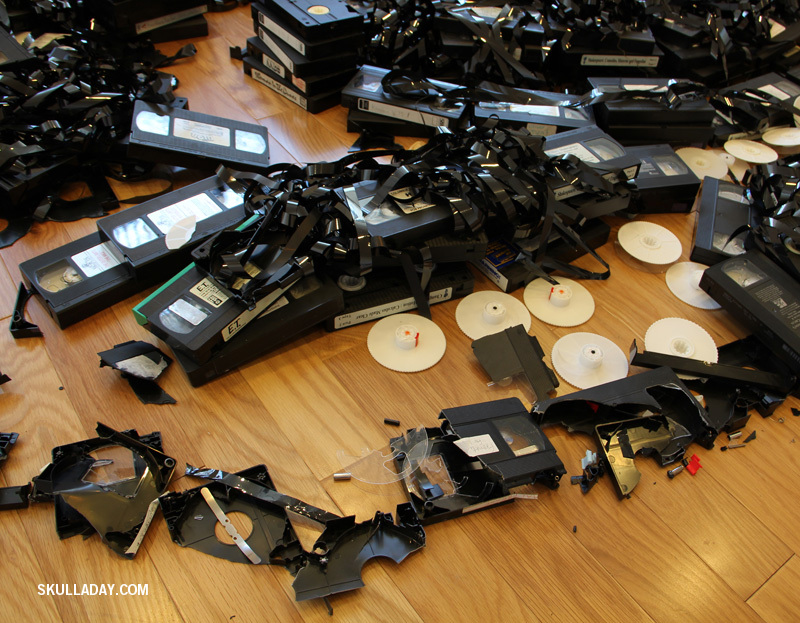 Thanks for the incredible submission, Doug! 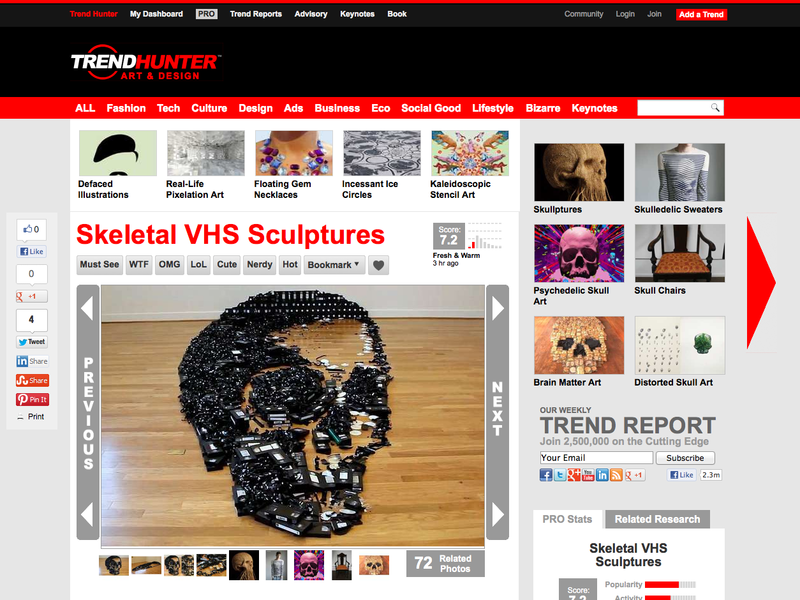 Artist Tim Tindall of St. Louis, MO sent us a pair of skulls he created. As we take notice of the official end of summer, there is something haunting about these pair of skulls to help us get in the mood for our favorite fall holiday. 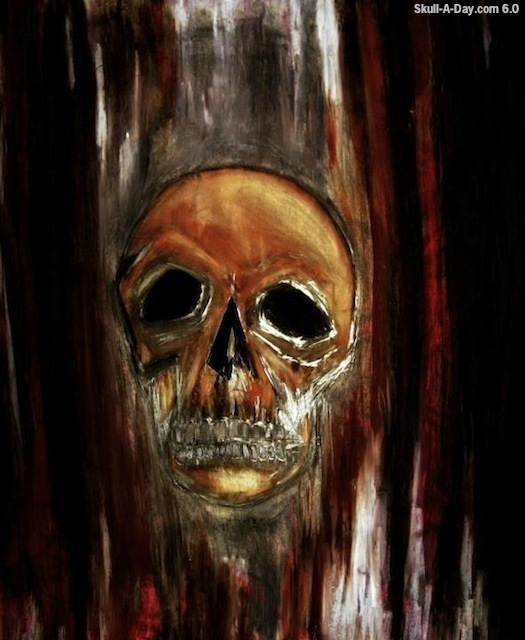 The first work's composition reminds me of a type of wood-grain in which a traditional knot appears as a skull, which would be an interesting faux finish. Thank you for submitting this work for us to share. 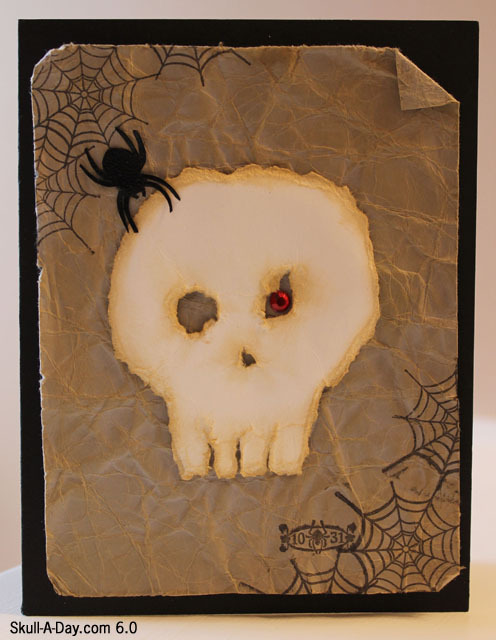 Jennifer Ferrell, created a skull card for Halloween. Receiving a card is always a nice way to know someone is thinking about it. Receiving a hand made personalized card oozes love. 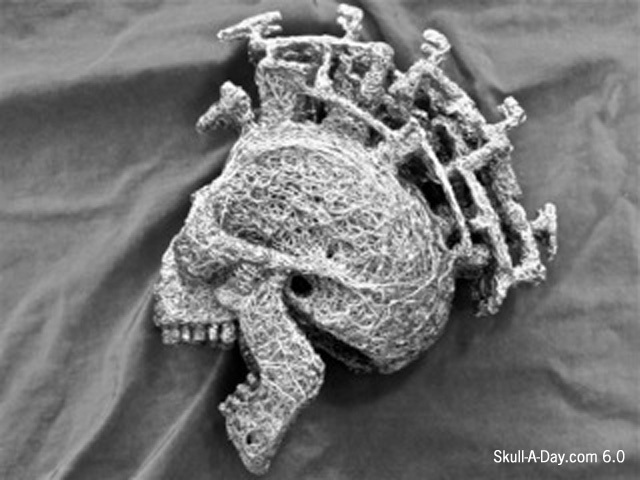 Jennifer created the skull by tearing and aging white cardstock. She used a stamp set for the spider and web designs. She placed a red rhinestone in the misshapen eye, to resemble a pirate's eye patch. For more of Jennifer's work, visit her blog, Ferrellgraph. 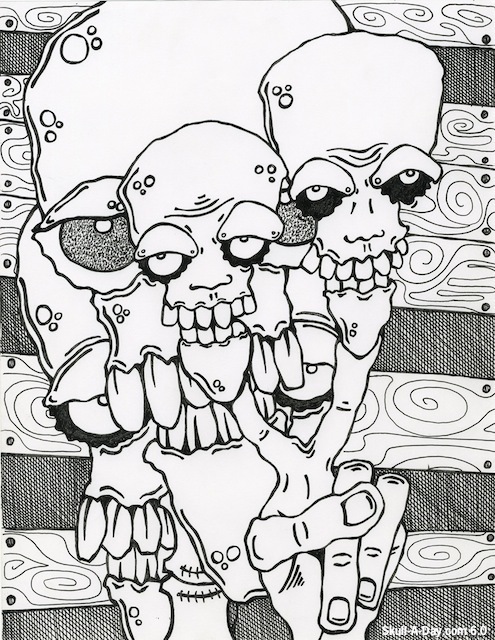 Brent Griffith from Statesville, NC told us: "Here's a couple of drawings/doodles I did using ball point pen and Sharpie markers." Thank you for sharing these amazing pieces with us. 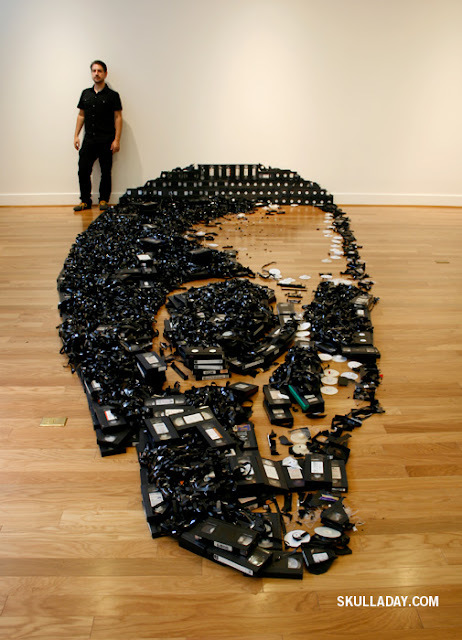 You really demonstrated that when an artist knows how to wield their tools great things are possible. I am mesmerized by the tight lines you were able to produce, it appears to be more screen-like than drawing behind your skulls. This contest is over. Thanks to everyone who participated and left a comment. Don't forget that you have until 11:59:59 PM EDT TONIGHT Wednesday, September 19th to be entered to win this amazing prize pack from, SKULLebrities®. 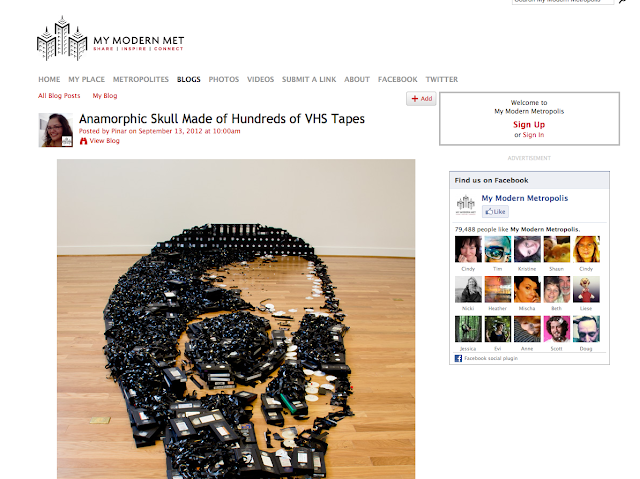 Follow the link to the original post HERE or click on the ad at the top of the sidebar. Of course you don't need to wait till the end of the contest to get your own SKULLebrities® creation. 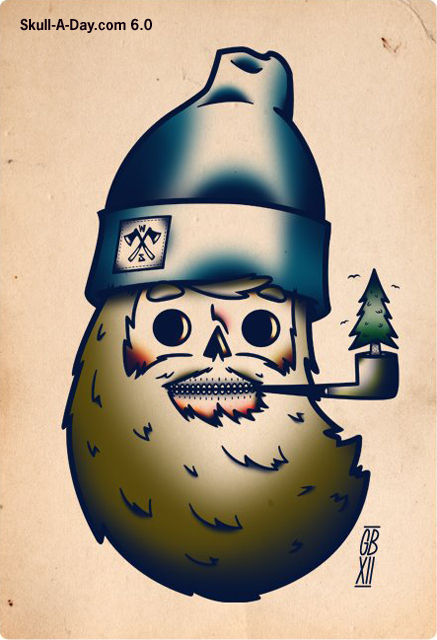 Visit their shop to purchase one or more of their SKULLebrities® design, they are even offering a 25% discount for all our fans until September 30, 2012. Enter SKULLADAY at checkout to get the discount. 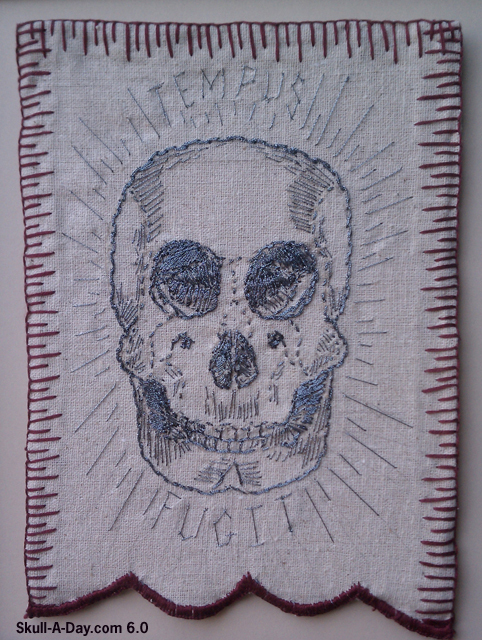 Monica Pierce repays a friendly favor with this excellent embroidery skull reminding us how time flies. 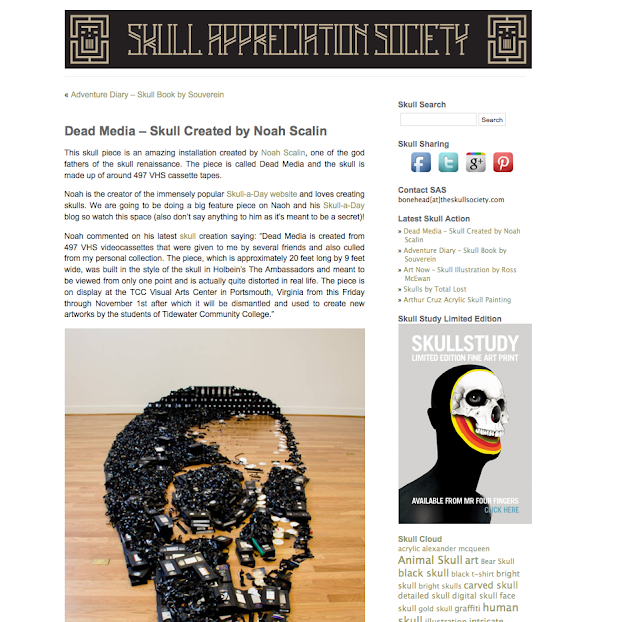 She also included this descriptive note, "I've been working on this embroidered skull for a few months now for a good friend of mine (named, Rad) who helped me with not one, but two websites!" "I wanted it to be as far from modern technology as I could, as a counterpoint (pun intended) to his work with computers, web design, film and photography for the NASA Space Program. I was looking for some inspiration to complete the work and found your site." What would we have if we didn't have friends? We'd have a lot of lonely skulls out there, who would eventually recognize the common bond and find a friend out there somewhere. Monica shows her thoughtfulness by diverting from Rad's everyday world as much as possible. Rad has a rad friend, and we thank her for sharing her embroidery with us! 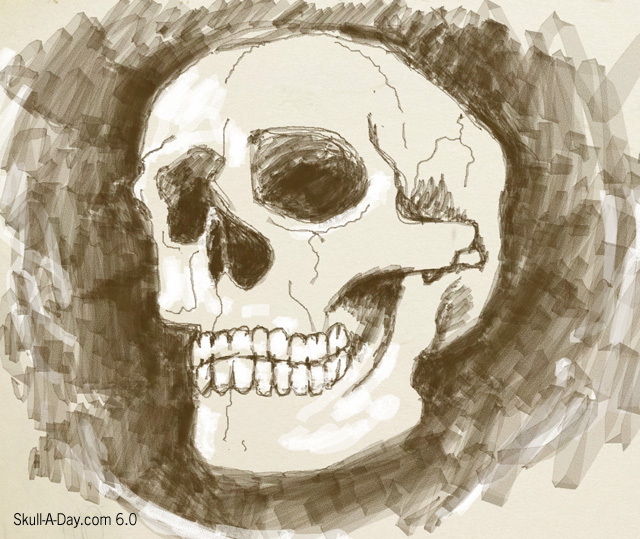 Nick Newton from Calgary, Alberta Canada, created an odosketch of a skull. 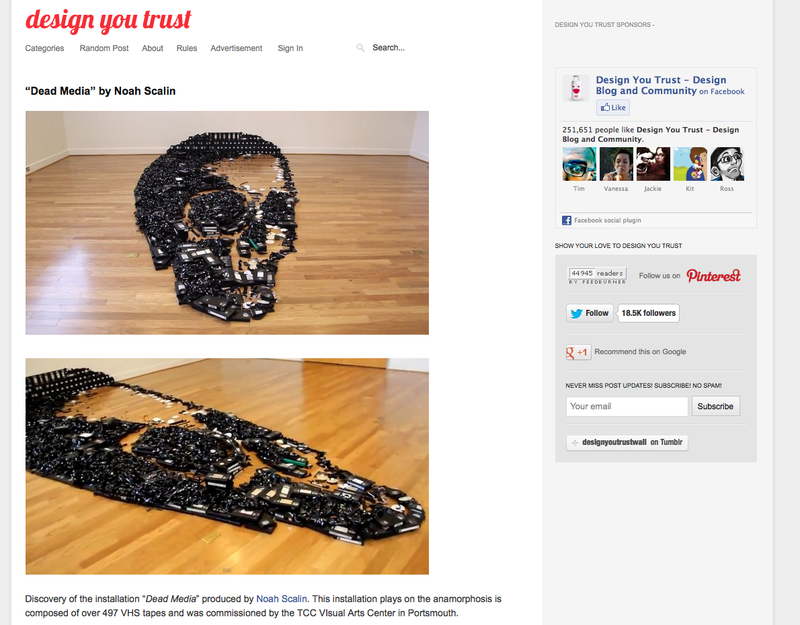 odosketch is a site I hadn't come across before, but it's fascinating. It's a bit like drawing with light markers, and takes some time to master, as the color goes from small to large the faster you sweep it. 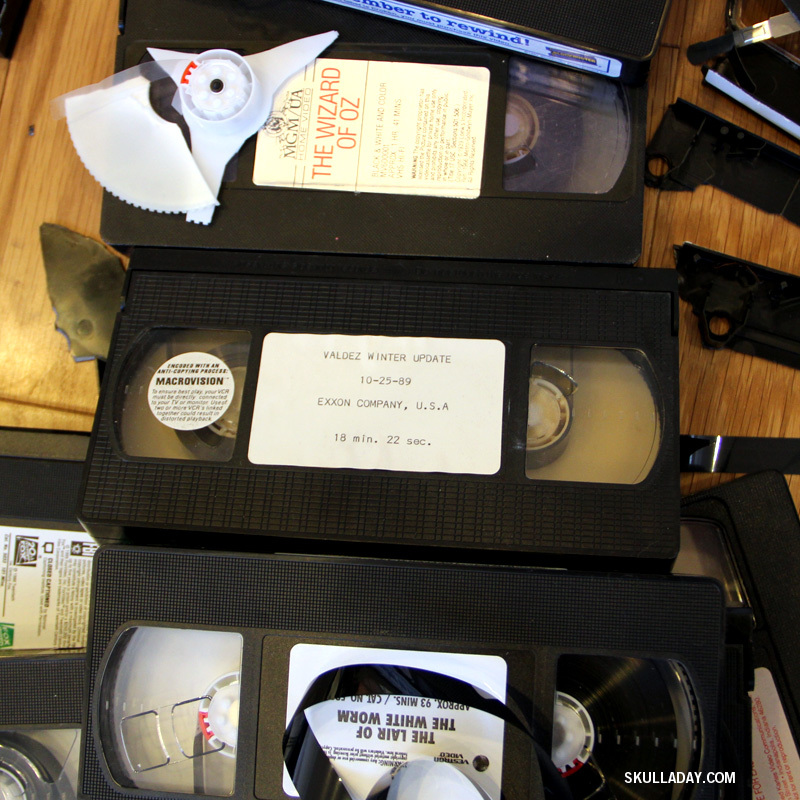 The amazing thing about it, is that once your sketch is complete, you can watch the playback of how it was created. This is a great tool for digital doodling, and something that I'm going to let my daughter sketch on. 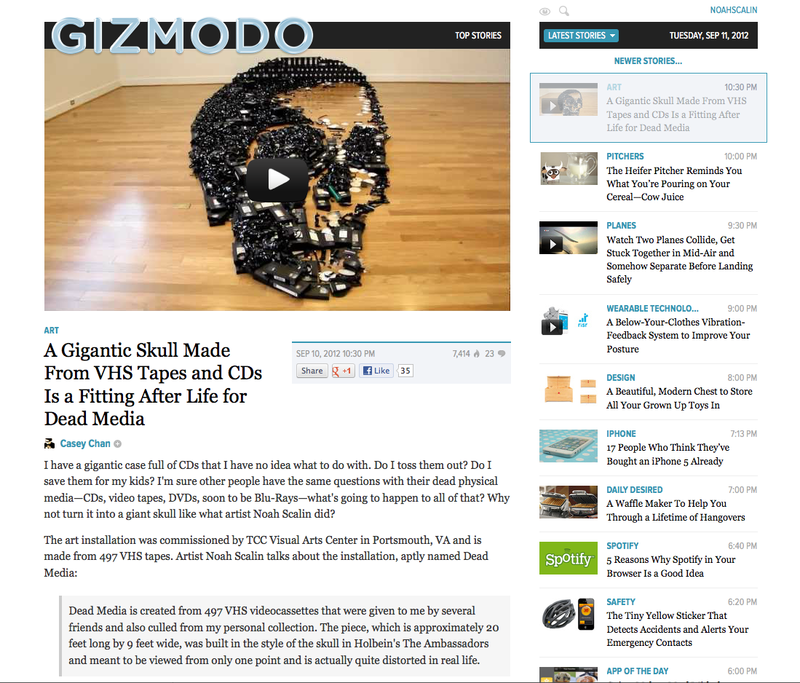 To see Nick's skull being created, view it here. Don't forget that you have until 11:59:59 PM EDT Wednesday, September 19th to be entered to win this amazing prize pack from, SKULLebrities®. Follow the link to the original post HERE or click on the ad at the top of the sidebar. Brightduo found this rock on the beach. They said: "The SeaSkull: is made from lava carved by the sea." 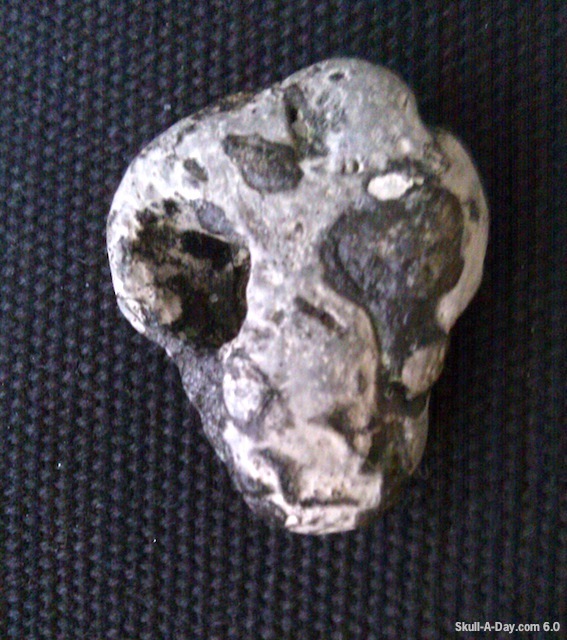 Stacie Cory sent us a picture of this rock that resembles the skull of a human-duck hybrid possibly named Howard or Donald. Rocks as I have mentioned on previous occasions are probably one of the top 5 items in which simulacra are found. It is always a pleasure to feature some new ones. Thank you both for your contributions. 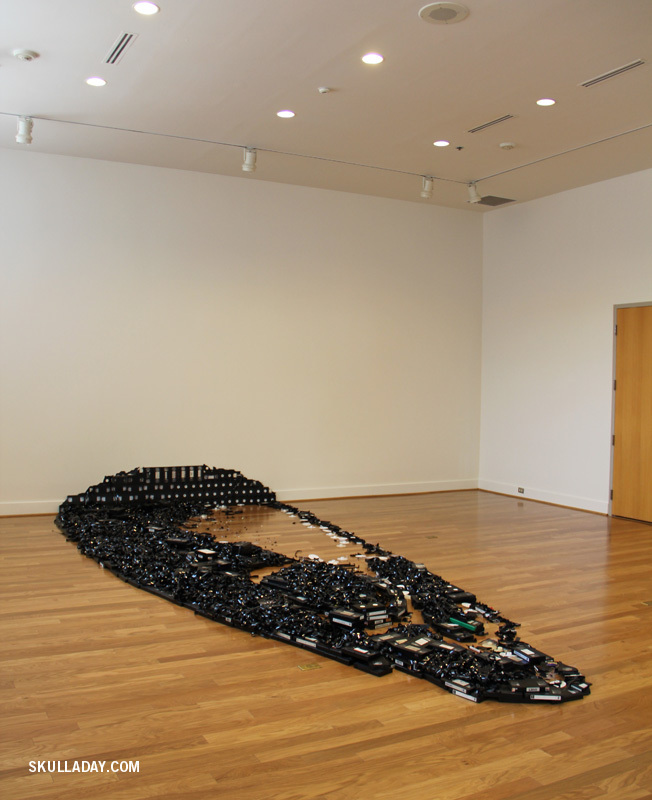 The piece is on display through November 1st at the TCC Visual Arts Center in Portsmouth, VA, so there's still time to see it in person! 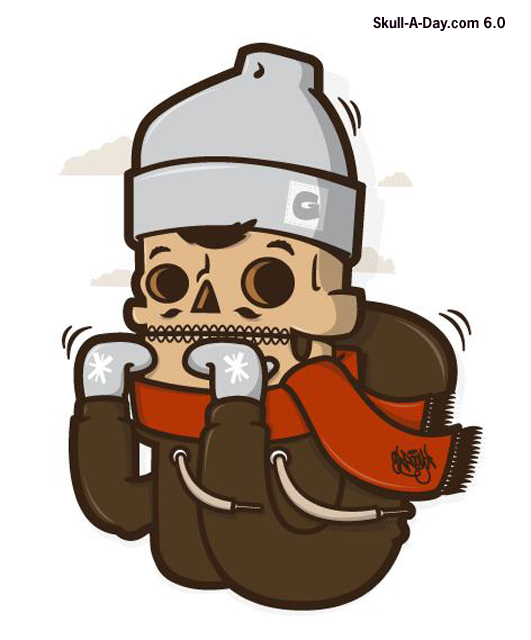 Somewhere in Warsaw, Poland the Dirty Boogie Crew is doing their thing, and Gbooy is putting in his work with these delightful illustrations. As we enter the fall time of year these skulls seem appropriate in getting us prepped for the winter to come. Flannel shirts, gloves and toboggans, and most especially (and my favorite) beards are definite indicators of the approaching season. Thanks for the great addition to our seasonal collection, Gbooy! adding as a final touch- diamontés." Congratulations on your joyous event, what a wonderful topper you created to celebrate your love for one another. Best wishes from our Skull-A-Day family to you both. Thank you for sharing a piece of your special day with us. Iconic celebrities that have brought us enjoyment in life can continue to do so even after they have passed. Show the world that you remember your favorite icon with one of the many perfect accessories that the team at SKULLebrities® has for you. 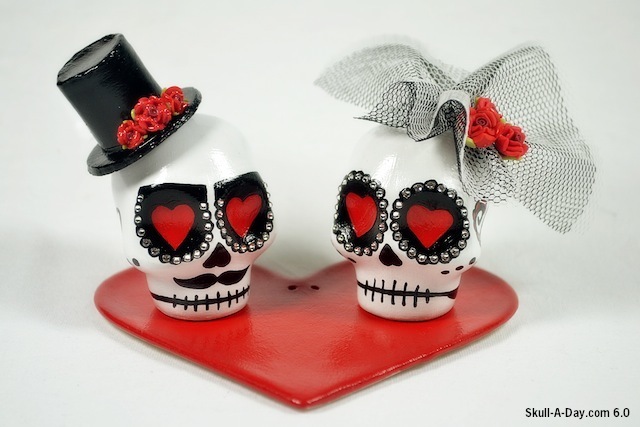 In addition, to share their love of skulls, SKULLebrities® has two prize packs (one female and one male) to give-a-way to our lucky Skull-A-Day fans! humorous parodies that allow fans to honor + celebrate the lives of their favorite celebrities in a new, unique way." 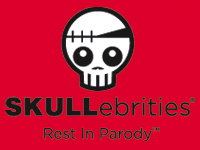 Two lucky winners will receive a SKULLebrities® prize pack including a T-Shirt of their choice PLUS 3 magnets sent in the SKULLebrities® award winning coffin shipper. All the major award shows have a segment dedicated to those who have passed. To enter this contest leave a comment telling us: Who is your favorite SKULLebrities® winner or who you would choose to nominate to SKULLebrities® status. Whomever your choice is, please leave a comment below, as your entry. Don't forget to include a way to contact you (either an e-mail in the post OR make sure your Blogger profile has a working e-mail link for you on it). Entries are only valid with this information. You have until just 11:59:59 PM Eastern Daylight Time Wednesday, September 19th to enter so don't delay! NOTE: This contest is open to all in our global community as SKULLebrities® will pay shipping for a possible international winner. The piece is on display starting this Friday and up only through November 1st at TCC Visual Arts Center in Portsmouth, VA.
Shane Rodriguez from Denver,Colorado created this skull titled, "Emerging Insanity". If you've ever had such an awful day that you just want to scream at everything, then this sculpture will speak (scream?) to you. Of course it also reminds me of Edvard Munch's painting "The Scream". 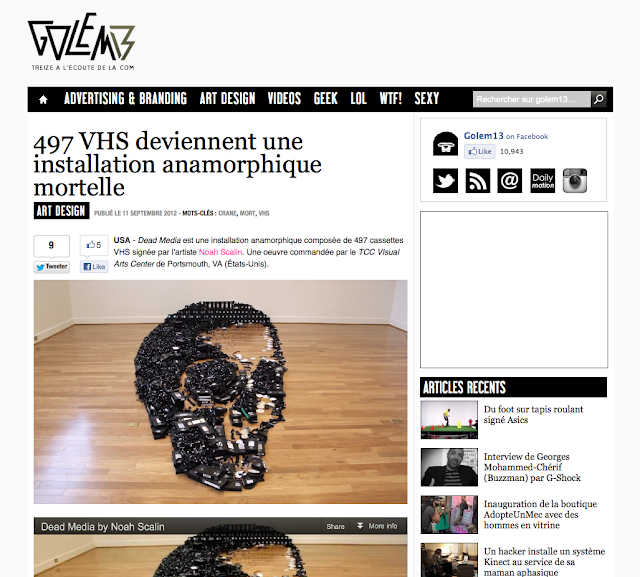 For more views of this piece, go here. 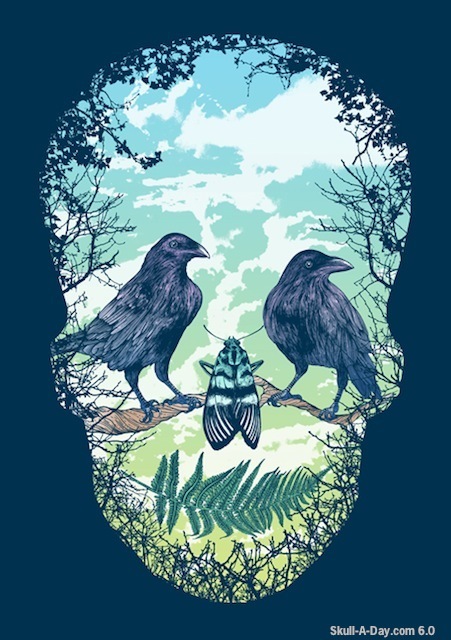 Philadelphia, PA artist Rachel Caldwell sent us an illustration she titled "Nature Skull". 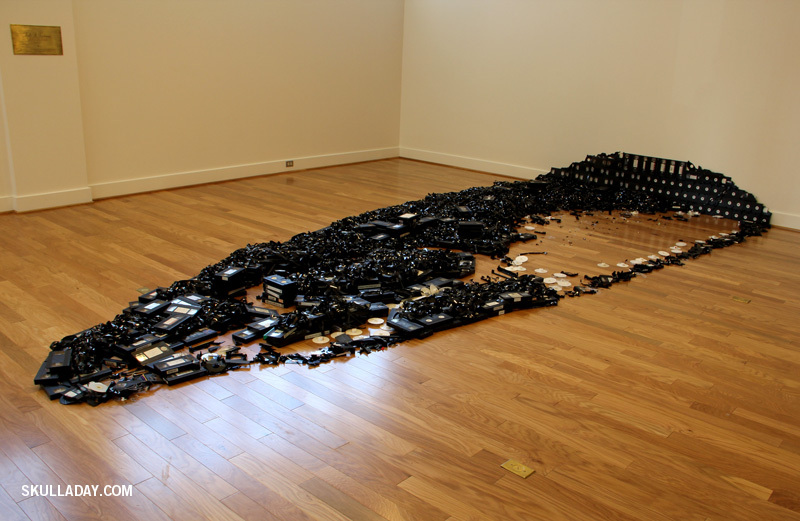 I enjoyed viewing this piece. One could imagine this being viewed from many different perspectives. My favorite however is looking through a hole in the hedgerow. Perhaps if this is the bustle we hear so much about, we should be alarmed now. Thank you for sharing your work with us. Just as mysterious as a black cat; this incredible painting is from Calyn Williams. The shading in this piece has me purring. Usually cold blacks and grays carry a feeling of warm fuzziness with them, just like almost every cat on this planet. This kitty has found a home if the afterlife here on our site, and for that we thank you, Calyn. 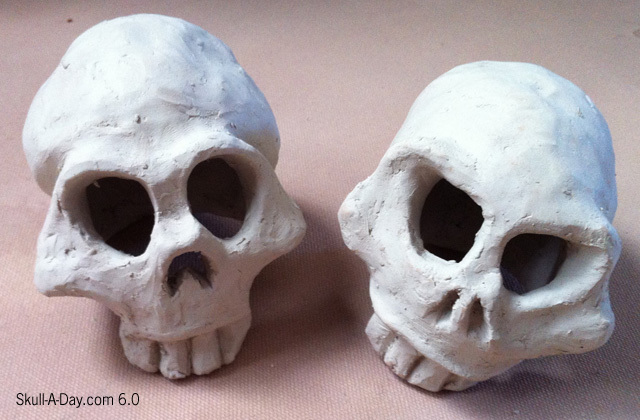 Nick Newton of Calgary, Canada, crafted two skulls out of clay. The deep set eyesockets caught my attention immediately. They are very expressive and haunting. I love the stylized sculpting of the cheekbones, nasal holes and teeth. As with any art, how you create your vision is up to you. The results of your process are unique and speak volumes about you. How someone may perceive your creations, may be all together different than how you view them. That in it's self is a beautiful thing. We are all different, including our own skulls. 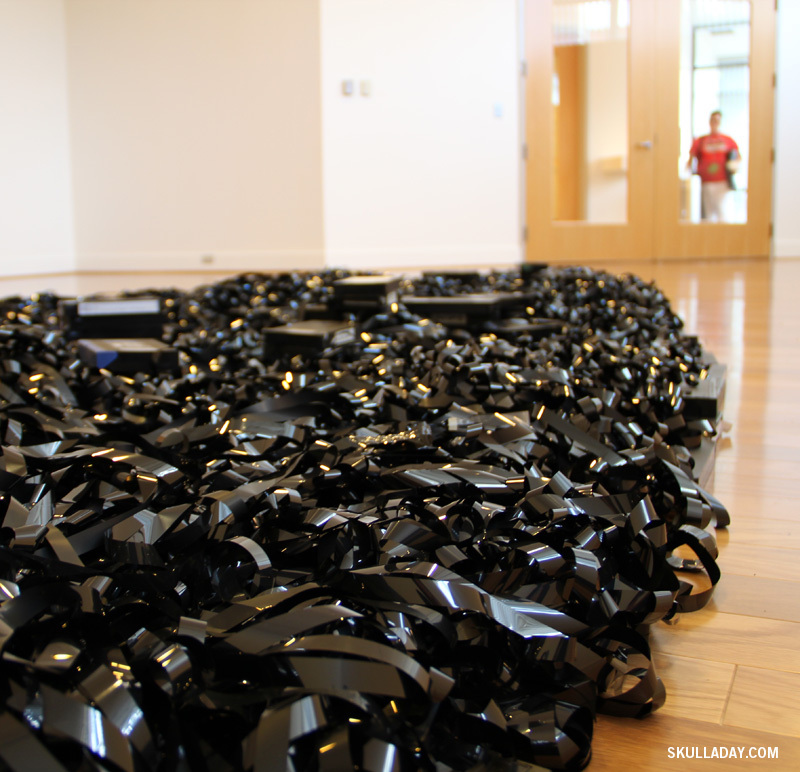 It's made from 497 VHS videotapes, which were kindly donated by several friends (thanks again Mimi, Robin, Quillan, and Stephanie), the staff/students of Tidewater Community College, and also culled from my personal collection. In the spirit of the famous painting The Ambassadors by Hans Holbein the Younger, the skull was created to only look correct from one point and is actually quite distorted in real life. The piece will be on display from September 14 through November 1st at the TCC Visual Arts Center in Portsmouth, VA, and if you're in the area, you're invited to come to the opening reception this Friday starting at 7pm. Details can be found HERE. Students at the school have been encouraged to take the tapes when the piece is dismantled and create their own skull art.